Praveenkumar Aivalli, MK Swamy, Ashwini B Narasannavar, Mubashir Angolkar, Ashutosh Shrestha, Bijendra Banjade. Background: Birth weight is influenced by various biosocial factors, and many unfavorable conditions may affect the health and general well-being of the mother. One particular factor cannot be attributed to the incidence of low birth weight (LBW). Objective: To determine the biosocial determinants of birth weight in rural Karnataka, India. Materials and Methods: This was a cross-sectional study conducted at a rural Primary Health Centre of Belgaum district of Karnataka. All the 159 women delivered during the time of study period were included in the study. Proportion and X2-test were applied to see the association between different variables. Results: The prevalence of LBW was 27.7%. The birth weight of children was associated with age, educational status, socioeconomic status, and interpregnancy interval of the mothers (p < 0.05). Conclusion: The study suggests that the awareness about the locally available nutritious food for dietary intake should be increased. The culture of marrying the daughter of age less than 18 should be discouraged by imparting the health education regarding its impact on health. 1. Gawande UH, Pimpalgoankar MS, Betharia SH. Bio-social determinants of birth weight. Indian J Community Med 1994;19:2-4. 2. Sengupta P, Sharma N, Benjamin AI. 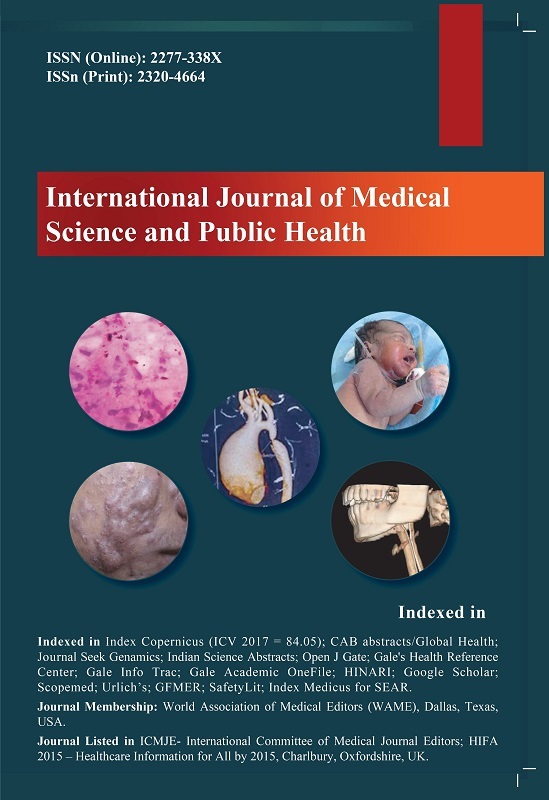 Risk factors for low birth weight: a case control study in Ludhiana, Punjab. Indian J Matern Child Health 2009;11:1-2. 3. UNICEF. Regional and Global Estimates. New York: UNICEF, 2004. Available at: http://www.unicef.org/publications/index_24840.html (last accessed December 22, 2014). 4. World Bank [homepage on the Internet]. India Health, Nutrition and Population. Available at: http://www.worldbank.org.in/WBSITE/EXTERNAL/COUNTRIES/SOUTHASIAEXT/INDIAEXTN/0,,contentMDK:21461176~pagePK:141137~piPK:141127~theSitePK:295584,00.html (last accessed December 22, 2014). 5. World Health Organization. International Statistical Classification of Diseases and Related Health Problems, 10th Revision. Geneva, Switzerland: WHO, 1992. Available at: http://www.who.int/classifications/icd/en/ (last accessed December 22, 2014). 6. Sengupta S, Barua M. Maternal biosocial factors affecting birth weight in ahoms of Assam. J Hum Ecol 2002; 13(4):333-4. 8. Roy S, Mothere DD, Ferreira AM, Vaz FS, Kulkarni MS. Maternal determinants of low birth weight at tertiary care hospital. J Fam Welfare 2009;55(1):79-83. 9. Memon Y, Sheikh S, Memon A. Maternal risk factors affecting birth weight of newborn. J Liaquat Uni Med Health Sci 2005; 2:95-6. 11. World Health Organization. Multiple-Micronutrient Supplementation for Women during Pregnancy. Available at: http://www.who.int/rhl/pregnancy_childbirth/antenatal_care/nutrition/plco (last accessed December 22, 2014). 12. National Institute of Health and Family Welfare. Reproductive and Child Health Programme. Available at: http://nihfw.nic.in/ndc-nihfw/html/Programmes/ReproductiveAndChildHealth.htm (last accessed December 22, 2014). 13. Ministry of Human Resource Development. Mahila Samakhya Programme. Available at: http://mhrd.gov.in/mahila-samakhyaprogramme (last accessed December 22, 2014).